Dani Stahl said it best, minutes before the lights dimmed for Nicole’s show, “Last season Nicole experimented a lot with prints and designs, and I am excited to see if she does the same this season.” Nicole did not disappoint, and recreated the looks and trends that the late 60s and 70s set in place. Being at the show was like sitting front row at a glamourous concert, watching rock and roll fashionistas strut their stuff on the runway. The models kept their hair simple, donning a classic 70s long pin straight look, and kept their make-up clean and fresh. Gorgeous floral blouses and dresses were paired with suede vests and jackets, velvet pants, fringes, and cool purple and blue furs complimented the fun, but sophisticated collection. I asked Nicole backstage what inspired her to revisit this era. “Everything recycles throughout history. I picked this era because it parallels our time today. I could have designed 60s mod looks, but this was what I was in the mood for.” I can say confidently that if Jimi Hendrix came back to life and were to wear any designer’s collection from this season it would absolutely be Nicole Miller’s. Nicole Miller wasn’t the only one who looked to past trendy decades for style inspiration. The always exciting and energetic Betsey Johnson brought the 60s back to life with her London mod inspired collection. On the backstage curtain, posters hung of classic 60s icons such as mini skirt innovator Mary Quant, and fashion icon Edie Segdwick. The show began with black and white palettes, which progressed toward a burst of color. Hot pink stockings were matched with orange accents. If anyone knows how to throw a backstage fashion show party, it’s Betsey herself. With a DJ spinning tunes to keep the energy up, and a table with an assortment of candies and champagne and signature Betsey Johnson cupcakes compliments of Baked by Melissa (I even stashed a few extra away in my bag to enjoy later), the real fun was definitely happening behind the runway. Taking my seat at the Downtown Armory, waiting for Marc Jacob’s show to begin, a mysterious and cold feeling settled in. Ominous tones sounded throughout the armory, matching the set of a decaying landscape of grottos with elements of a Tim Burton fantasy. Marc brought the term fashion “show” to its literal level–he surely puts on a show. The clothes contrasted against the decaying background and winter melancholy brought serenity and regality. 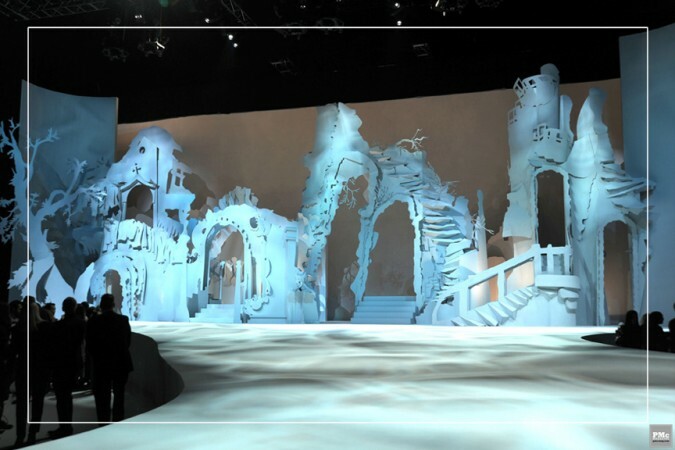 The models entered the runway through the set’s arched staircases. What was truly breathtaking was the creativity of the silhouettes and layering, presenting the idea of an overly chic bag lady walking the cold winter streets somewhere in London. (I imagine London since the musical accompaniment to the clothing was “Who Will Buy This Wonderful Morning” from Oliver.) Oversized knitted stoles were layered over coats, chunky sweaters, and padded tweed cocktail dress. Knee length skirts were structured as over-exaggerated hourglass shapes, and dresses were often placed over skirts. The accessories were just as stunning as the clothes themselves. All the models wore Pilgrim shoes with jewel buckles paired with socks, and each outfit was accompanied by a dramatic oversized hat tying together the whole look. No matter how many words I can come up with to describe the emotions of watching this show, it will never do it justice. The collection was nothing short of charming, and I am overjoyed I got to witness Marc’s beautiful story unfold in front of me.